Louise is the perfect glimpse into the world of Wolford's amazing design process. It is a floral pattern, but one that is unique and has been reinvented so as not to fall into the pitfalls of being conventional. 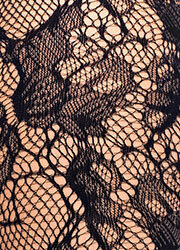 The pattern is recognizably a floral lace, but the differences are apparent too. It is as if Wolford has zoomed in on the flower petals or leaves and taken a microscopic perspective of the thing, then knitted it together in the flesh. It gives this item a strange and ethereal look and makes you really thing about what fashion can do. This is what great style is all about. Please note- The model is wearing black briefs.